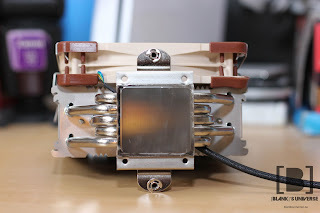 As computers are getting faster, CPU heat sinks are getting larger as well. 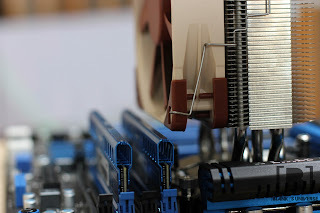 At one point, a huge cooler that covered the DIMM slots and had 2 fans was normal. 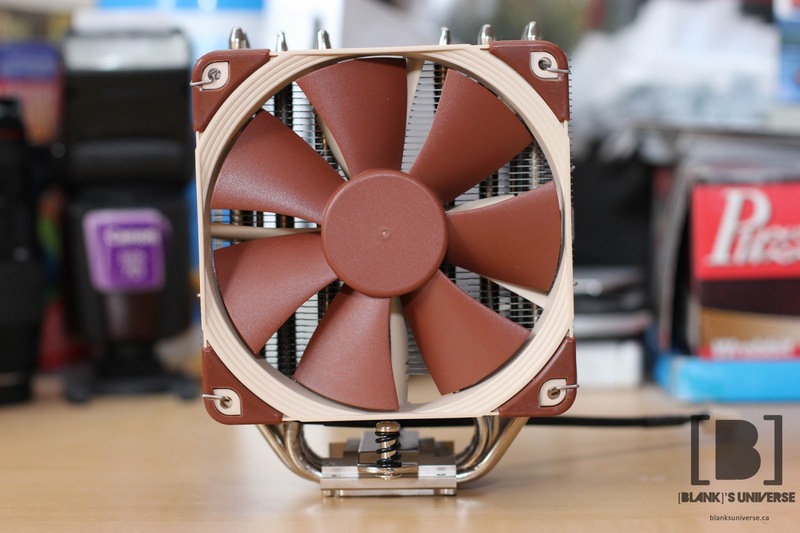 Noctua is going back to the basics, and creating a small single fan cooler everyone can use. 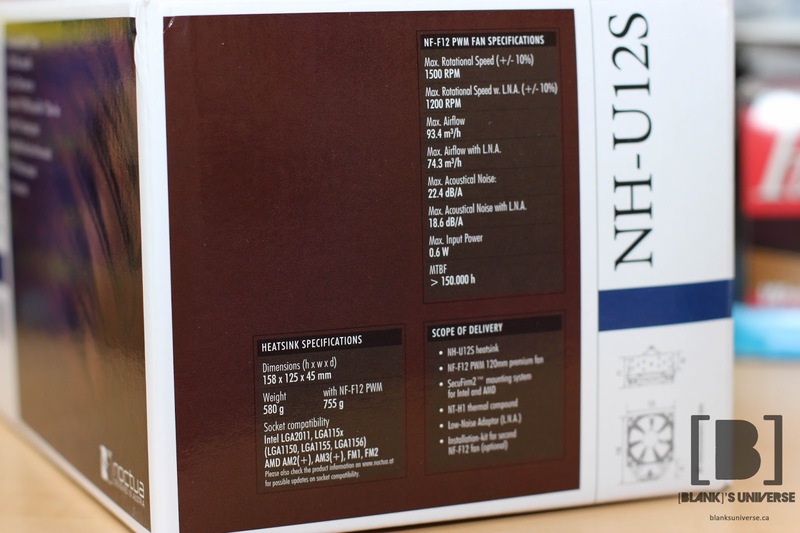 The NH-U12S is a 120mm model for their classic U-series coolers. The S-version's 45mm slim design ensures 100% compatibility with tall RAM modules creating compatibility with all modern motherboards. 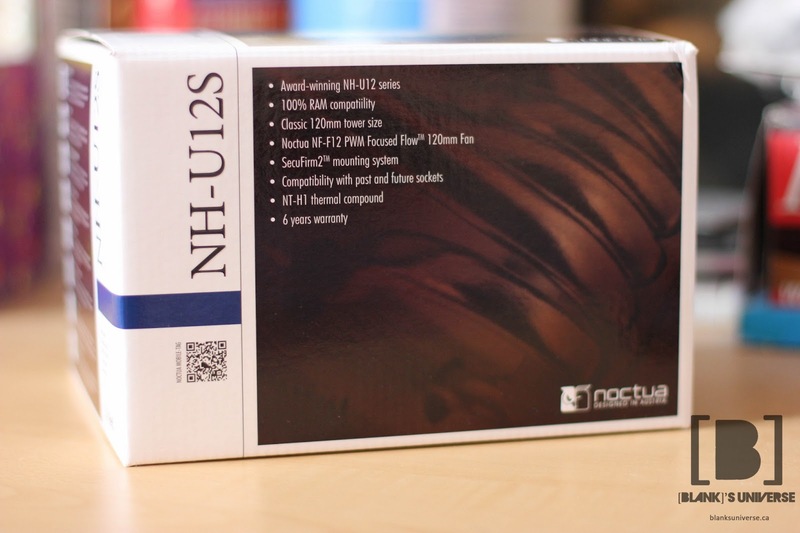 The UH-U12S also uses Noctua's class leading NF-F12 FocusFlow™ fans with Pulse Width Modulation (PWM) for fully automatic control as well as the ultimate quiet cooling experience. 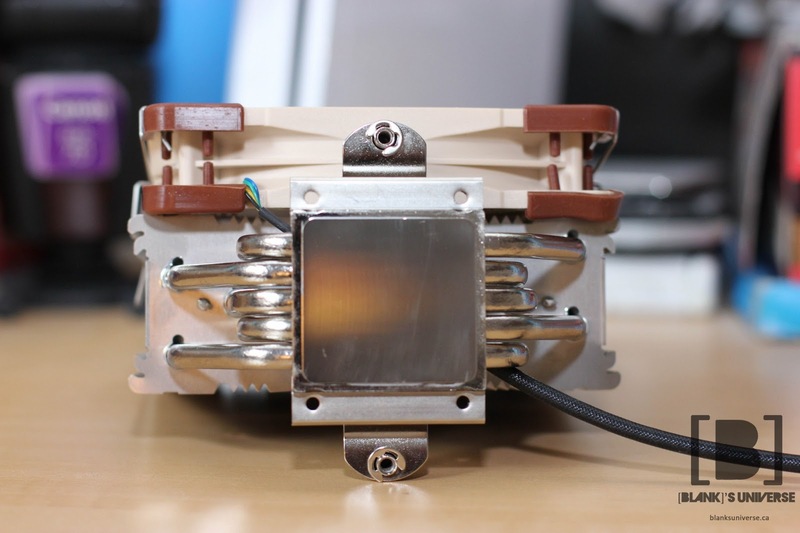 The heat sink uses Noctua's Securi-firm system, unfortunately dropping support for the LGA 775 and LGA 1366 sockets. 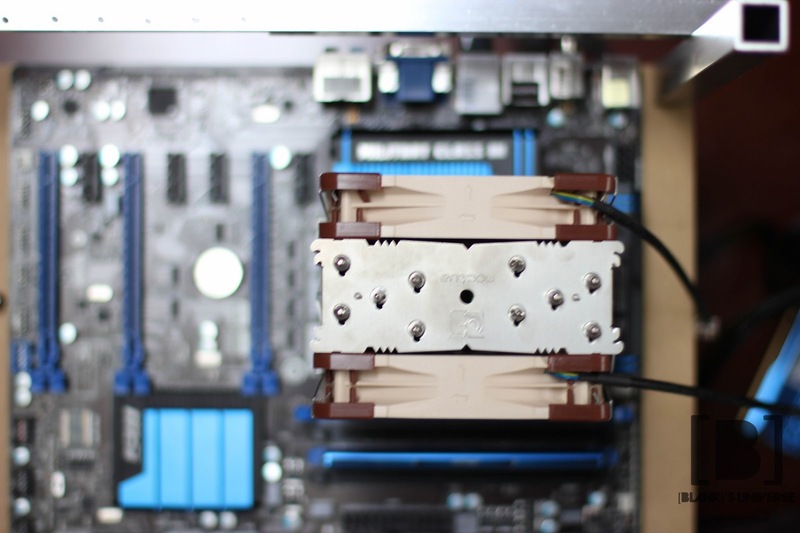 The heat sink is still compatible with current sockets as well as future sockets such as Haswell's LGA 1150. On the front of the typical brown Noctua box, we find a brief description of the fan and a silver badge addressing its award winning design. 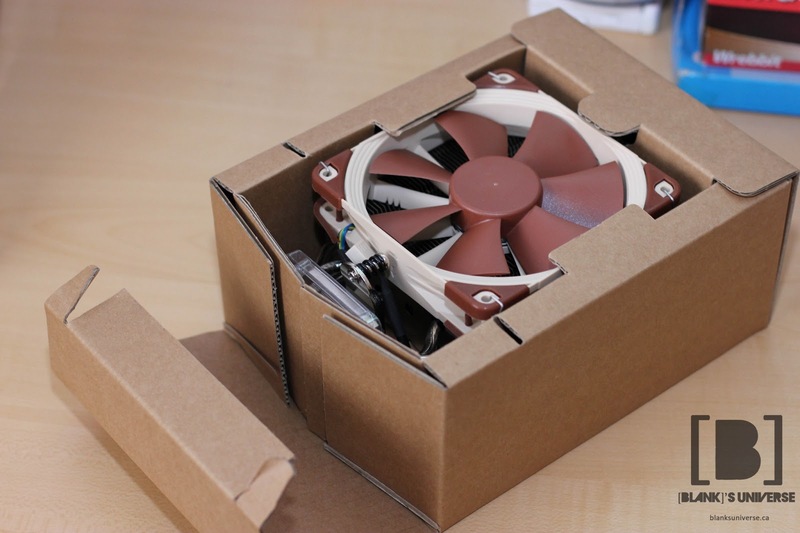 On the side, we find specifications for both the fans and heat sink, as well as the scope of delivery(?) and a 2D image of the heat sink. On the back, there is an explanation of what this design offers and why they chose to design this type of cooler, available in eight different languages. 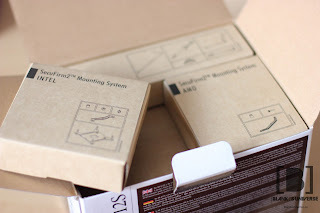 Once the largest box is opened up, we find three nicely labelled and organized boxes that makes installation a breeze, while also being very visual appealing. There is one box containing the mounting system for Intel CPUs and another box for the AMD processors. A third box contains the miscellaneous accessories such as extra fan mounts and thermal compound. 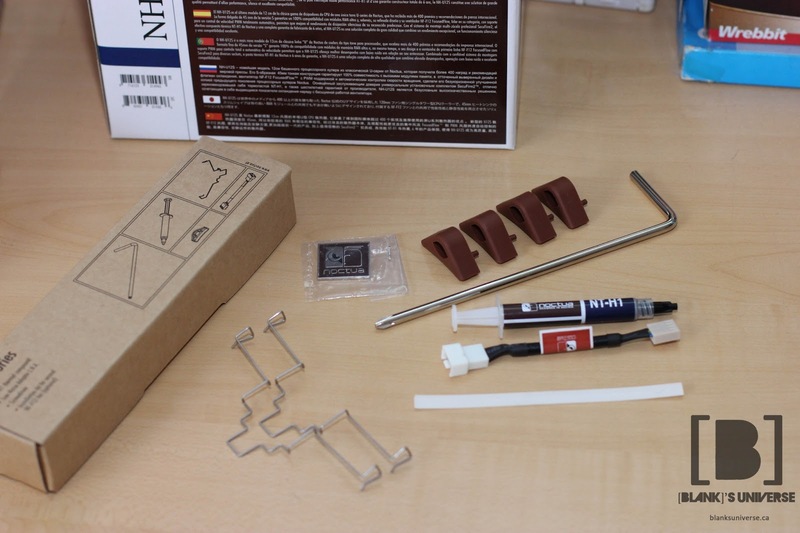 Included in the accessory box are mounting clips for an additional fan, Noctua's NT-H1 thermal compound, four extra silicon fan corners, a Phillips screwdriver, a low noise adapter for the fan, anti-vibration strips which can be used with non-Noctua fans to reduce vibration, and an extremely thick metal Noctua case badge. 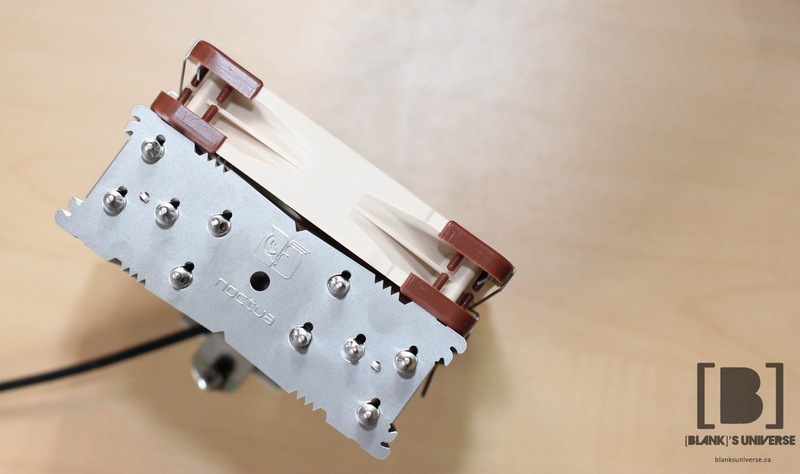 Noctua goes above and beyond the call of duty, having included literally everything you need to install the heatsink. Noctua is the only company I have seen so far to include a screwdriver with their products, allowing installation of the heatsink right out of the box. At the very bottom lies the heat sink protected by thick pieces of cardboard. It's nice to see companies use recyclable packaging. The NF-F12 PWM fans are a great match for this cooler as the fins are longer than the height of the cooler, allowing it to provide airflow to every fin on the heat sink. 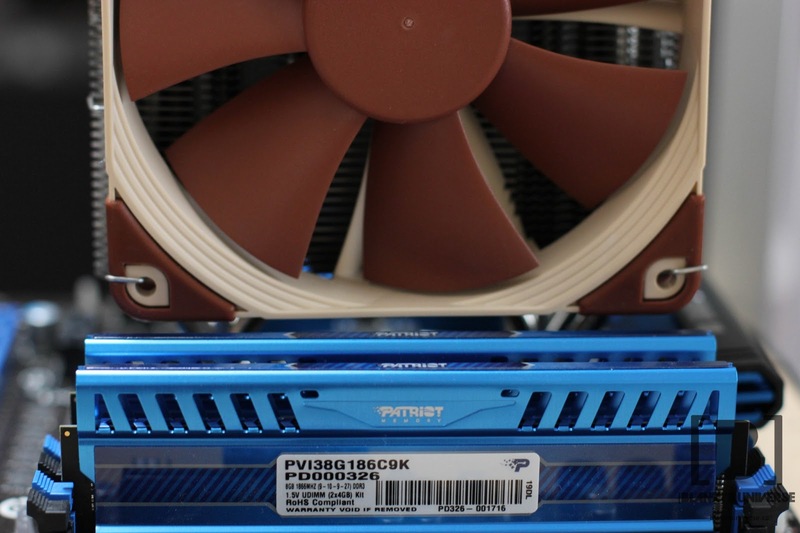 The cooler is is 158mm tall, 125mm wide, and 71mm deep with one fan installed. From the side you can see the slim form factor of the cooler as well the the fan mounting system, there are notches on the side of the fin array that allow the metal clips to latch on. The mounting system allows for easy tool-less installation and removal which makes cleaning the cooler a lot easier. On the back where there is no fan (although another fan can be installed), you can get an idea of how the grooves and teeth on the edge of the fins help break up air flow to reduce noise. You can also see how the heat pipes are spaced out. Every fin in the stack has the Noctua logo embossed on it which is not only for show, but which also increases the surface area as well as helping to break up the air flow. There is also a hole in the centre where you can use the included screwdriver to remove the hold down bar for the Securi-firm mounting system. I don't know why you would need to do that, but the option is there. You can see the slight curve in the middle of the heat sink as well as the notches that help break up airflow. The cooler is mounted by screwing the hold down plate on the heat sink onto the two brackets that are secured to the motherboard. 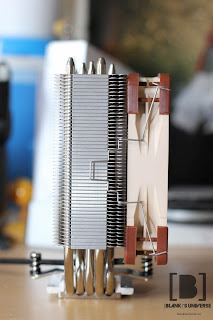 The five heatpipes are soldered between two copper plates making up the base. The base of the NH-U12S is milled and has arched grooves across the entire surface. The base of the heatsink is completely flat with no deformation at the edges, ensuring uniform contact with the entire CPU. There are staggered heatpipes to carry the heat away to different areas of the fin array. The heatpipes are quite angled near the centre of the plate due to the small form factor of this heatsink. 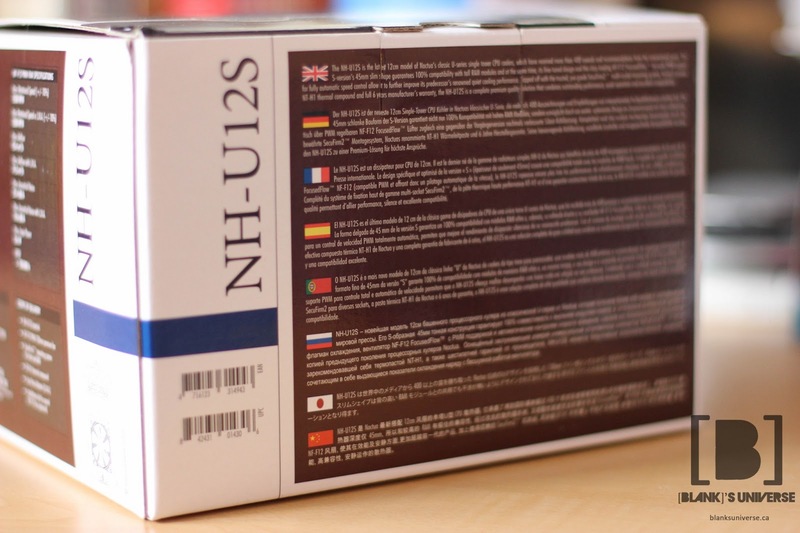 The NH-U12S has the ability to be used with two fans, by using the extra metal fan clips that were included in the accessories box. This allows for better static pressure and better performance. It also looks cooler. The extra fan increases the depth from 71mm to 96mm. Even with two fans, this cooler is still compatible with LGA 2011 motherboards when all the DIMM slots are populated. The Securi-firm system makes installation very simple. 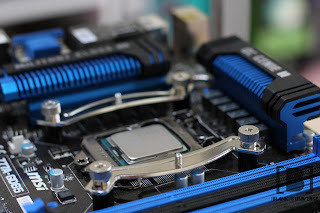 For Intel systems, simply align the extremely thick backplate with the three holes on the back of the socket and it should smoothly slide into the motherboard. for Socket LGA 2011, simple screw in the included risers into the built in backplate on the motherboard. Once the backplate is installed, flip the motherboard over and place the black risers onto the screws jutting out and screw in the top brackets with the curves facing away from the centre. All that's left is to screw it all down with the four thumb screws and you're left with an extremely secure platform to mount the heatsink onto. 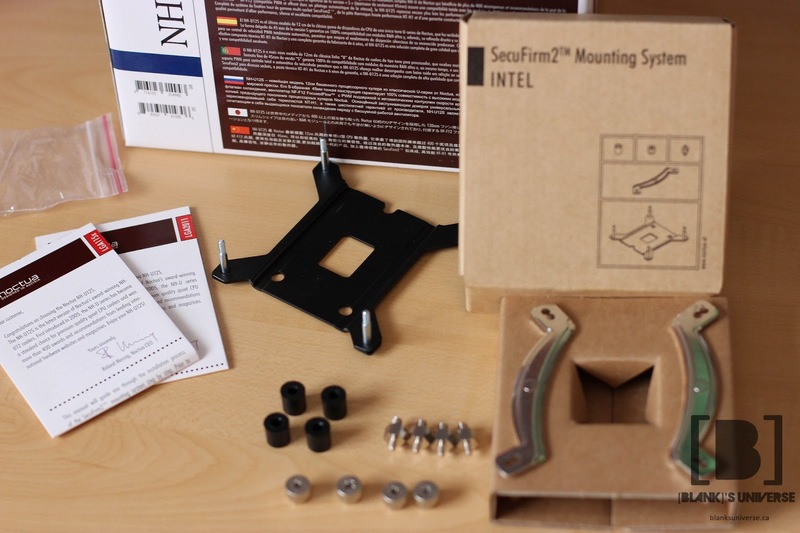 With the Securi-firm's extremely thick backplate, there will be little-to-no flex on the motherboard when the cooler is installed. 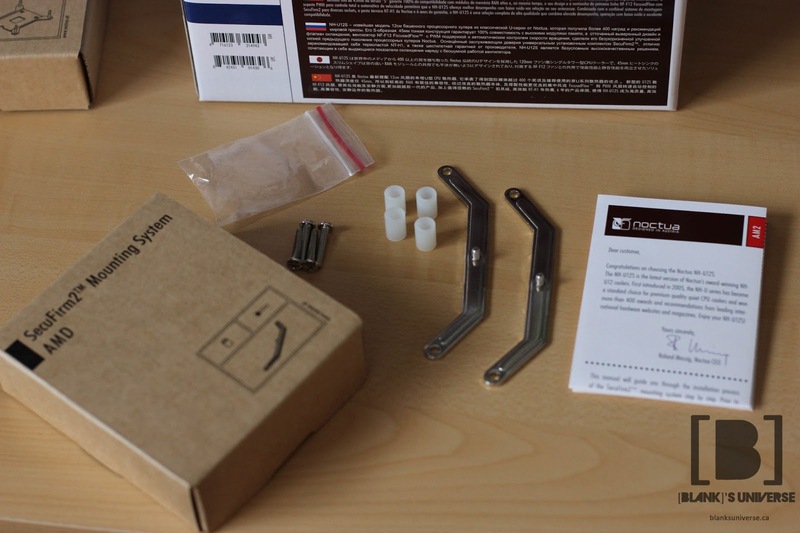 You will need to remove the fans to install the heatsink onto the brackets, but Noctua makes that easy with their toolless clips. Use the included screwdriver, or your own, to screw the two screws on the cooler to the brackets. The included screwdriver clears the top of the heatsink nicely and gives you a nifty tool to throw into your tool bag if you ever need it. 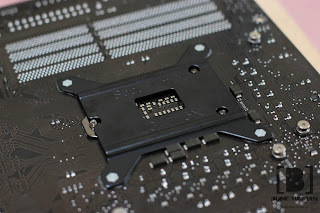 The black springs ensure that the correct pressure is placed onto the CPU, so just simply keep screwing it in until it stops. 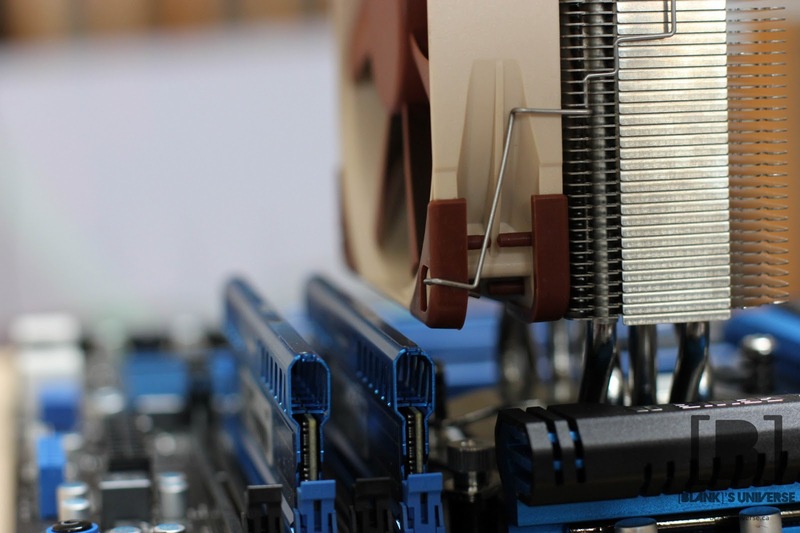 You can see that the cooler sits nicely right above the RAM I used. With two fans installed, it takes up more room, but still fits fine on the motherboard. The cooler can also be mounted in two orientations, blowing air horizontally across, or blowing air upwards. *Temperatures were measured using RealTemp with an ambient room temperature of 24 degrees Celcius and the system was left to idle or run on full load for 10 min before temperatures were taken. With a single fan, the NH-U12S offered temperatures of 60 degrees with a decrease of 4 degress with an additional fan. 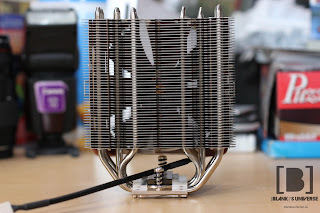 This offered a significant decrease of temperature compared to the stock Intel cooler. Once the CPU was overclocked to 4.2GHz, differences can be seen. 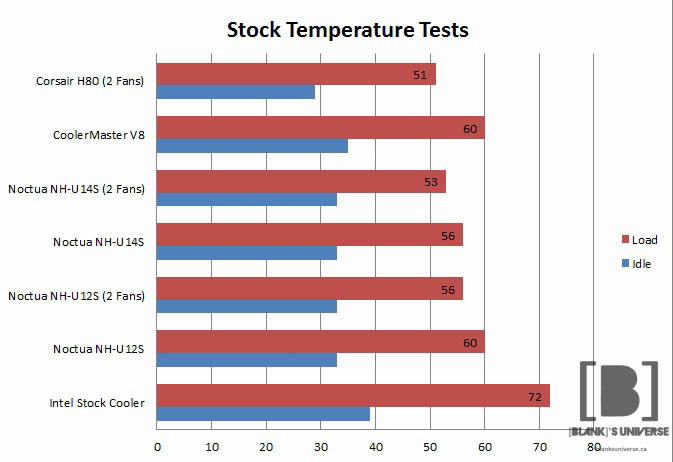 The difference between one and two fans is still 3 degrees but there was only a temperature increase of 9 degrees compared to stock clocks, allowing more room for overclocking. 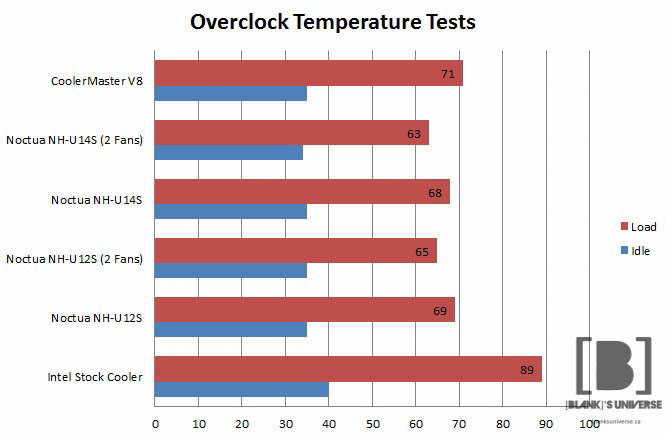 With the Intel cooler, the temperatures were quite high so overclocking with a stock cooler is highly not recommended. 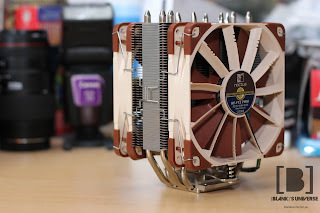 The Noctua NH-U12S is $80 at our local retailer, NCIX, so the heatsink does come at a high price. 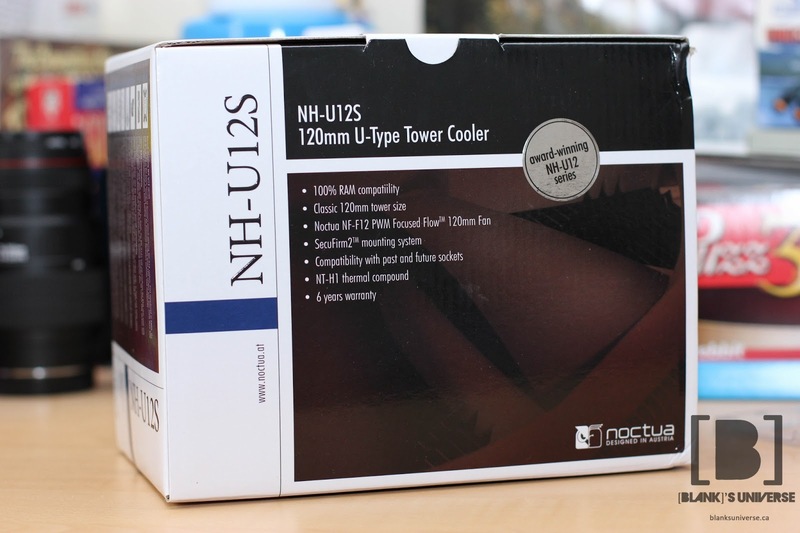 The NH-U12S is also a high performance cooler so the parts and build quality are held to high standards. 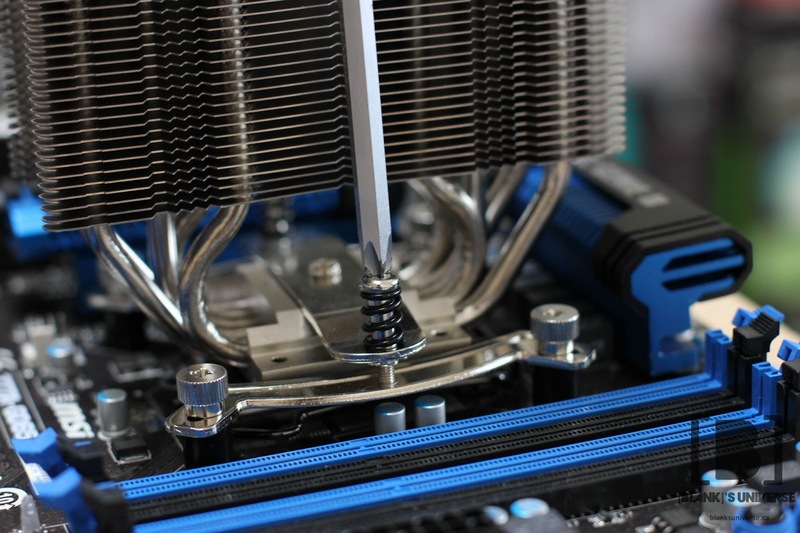 The heatsink offers great cooling without sacrificing silence. 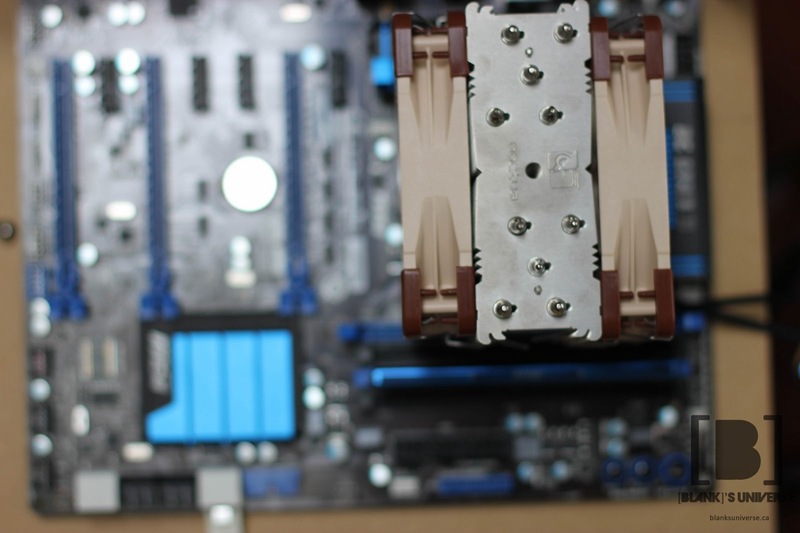 This is one of the quietest heatsinks we have tested so far and offers great performance. 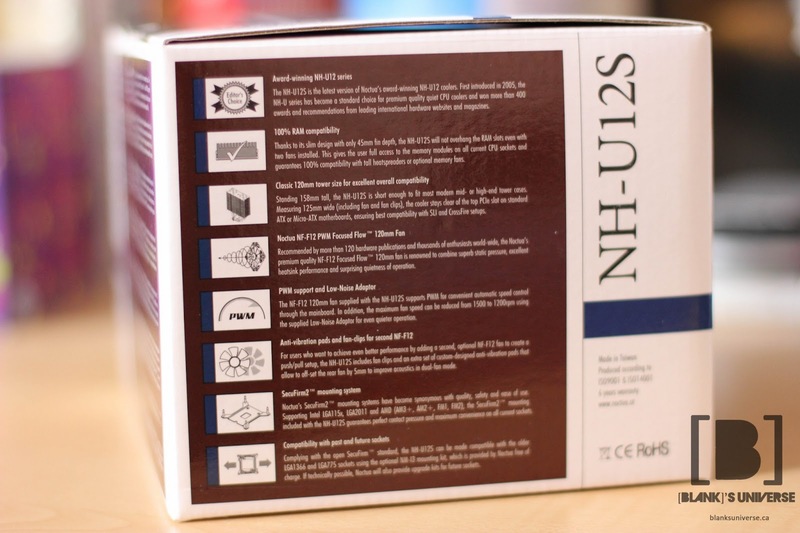 The NH-U12S is also compatible with all RAM modules so it is a great choice for first time system builders who are afraid of running into compatibility issues and reduces headaches. Noctua has put a lot of thought into designing the NH-U12S and it shows in the final product. 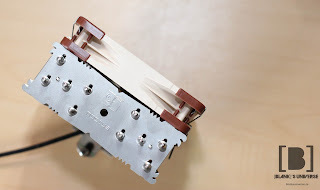 They have thought of ways to make life easier for the end user by using metal clips to secure the fans. A simple convenience such as using a single wire instead of fiddling with plastic inserts makes installation simple and the inclusion of a screwdriver means the end-user doesn't have to find one, or buy one if they don't own one. 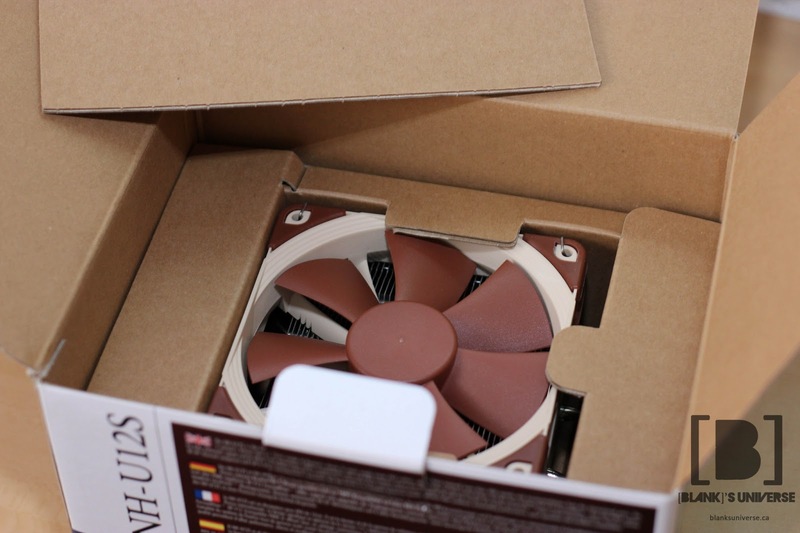 Noctua has also tried to make installation of the cooler and backplate easier by reducing the amount of things you need to hold in place. They split the installation into small easy steps so there are no headaches or broken parts due to installation. Since they dropped support for LGA 775 and 1366, they can simplify the backplate, removing the need to reposition the screws to line up with the holes. 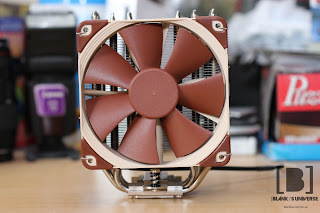 Noctua shows that you don't need a huge loud cooler for great performance, and that it doesn't need to be flashy with LEDs and plastic shrouds. All you need is great engineering to make a great cooler. 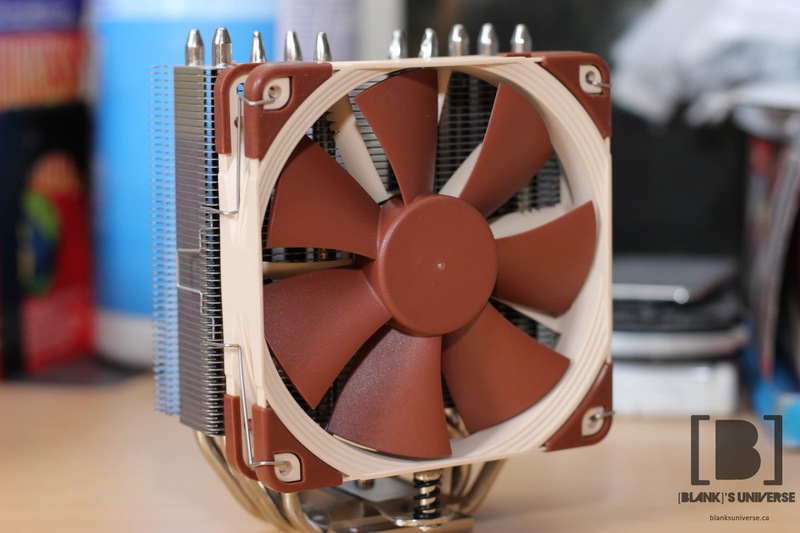 If you are in the market for a CPU cooler, make sure you take a look at the Noctua NH-U12S.